Valentine’s Day’s promise of dark chocolate offers us nutritionists a glimmer of hope: make the right choice and indulge only on the Big Day, and chocolate is a sensual, deliciously healthy treat. BUT...succumb to a month-long “free for all” that starts each morning at the barista (“Valentine’s drink”, anyone?) and ends each night on the couch with the clicker, downing sweets with your sweetheart and... well... you get the point. Of course, I love chocolate because it’s one of the most powerful plant foods on the planet (you may want to skip this paragraph if you already know about the health benefits). High quality dark chocolate is teeming with bioactive compounds such as flavonoids, which research suggests help improve our arteries’ endothelial function, lower blood pressure, and increase blood flow to the brain. Dark chocolate is also high in antioxidants called proanthocyanins that mop up free radicals. And that rush of pleasure you feel when you indulge? Chocolate helps trigger the release of feel good neurotransmitter dopamine, boosting your mood instantly. Everyone deserves to eat good food. In these extraordinarily turbulent times, talking about high quality, ecofriendly chocolate may make you think I'm posturing more like a foodie than a food revolutionary. But my interest in pointing you to the best ecofriendly chocolate available isn't because it's more elite, but because all the health benefits I mentioned happen only with high quality dark chocolate (containing 70% cocoa or higher). Secondly, many of the companies I've listed below are having powerful, positive economic and environmental impacts on people and the planet-precisely the type of change to "the system" that people around the world are rising up and demanding. So please, resist the urge to dump a bag of cheap candy into your shopping cart these next few days, and purchase smaller amounts of higher quality confections if you can. Bargain priced, highly processed chocolate products typically have a litany of unsavory ingredients tagging along like barnacles, such as high fructose corn syrup, waxes, trans fats, binders, and palm oil (and I won't even bore you with the research showing how much more you'll eat just by having tons of it lying around). Steer clear, too, of those new versions of traditional candy bars that claim to be loaded with healthy flavonols - if they aren’t Organic or Fair Trade Certified, you’re missing out on all the sweet rewards that come with greener, ecofriendly chocolate. Below are 7 of my favorite picks so you can splurge in a way that pairs top notch chocolate with top notch industry practices. In my opinion, the best chocolates have a fully transparent “bean to bar” story, ensure sustainable farming practices that help replenish and nourish the planet, preserve biodiversity, and support fair wages and conditions for workers. If you got it on the cheap, someone (or some vital ecosystem that helps protect the Earth) paid the price somewhere. Given then we are set to gobble 58 million pounds of chocolate this Valentine’s Day, those things matter. And while Organic and Fair Trade chocolate carries a higher price tag, the nutritionist in me says that in some ways, this is how chocolate should be priced: its higher price helps you to value it (when we value things we treat them with more respect and awareness), to savor it (you’ll be mindful when you eat it), and to see it as a true splurge (which means you’ll make it a special treat rather than eating fistfuls every day). A perfect lean and green strategy. Eat Right For Your Type: What Kind of Chocolate Eater Are You? 1. For the Trend Setter: ALTER ECO Dark Quinoa Chocolate is a crispy chocolate like no other. With the fun contrasting crunch akin to a Nestle Crunch bar, but so, so much better: made with cacao and quinoa from Bolivia, this chocolate bar contains 61% cocoa and brings together ancient ingredients from the Andeans. Quinoa adds nutritious iron, protein, and fiber to your splurge. 2. For the Serious Do-Gooder: Original Beans. This one really impressed me. For every bar you buy, local community farmers plant a tree that will support the forest; not just rare cacao trees, but a mix of trees necessary for lively biodiversity. And get this: each bar even contains a lot tracking number, which designates the location of a new tree so that you can track your contribution online. Oh, and the chocolate is breathtakingly good. 3. For Those Who Like to Double Down: Double your health benefits with Green and Blacks Ginger or Sour Cherries Chocolate Bars. Sour Cherries have powerful anti-inflammatory benefits, and help boost your body’s melatonin, a compound which helps ensure a good night sleep. Ginger contains powerful antioxidant, anti-inflammatory compounds, and helps soothe the gastrointestinal tract. 5. For the Romantic: Try Theo’s limited edition Ginger Rose and Cherry Pink Peppercorn Valentine Bars. Wrapped in gorgeous pink packaging, their description alone is as steamy as an adult Valentine: “The Ginger Rose bar infuses our rich dark chocolate with essential rose oil that yields to the heat of candied ginger”. 6. For the Salty/ Sweet: Salazon. Ignore the “bacon and chocolate” trend, this is perfect for those who crave salty/sweet in one fell swoop. Spanish for ‘salted”, Salazon’s chocolate bars use 100% organic, Rainforest Alliance–certified beans in small batches in the USA, and hand-sprinkled with natural, solar-evaporated sea salt. Other fun contrasting ingredients include black pepper and crushed coffee. Plus, these guys got the idea on a backpacking trip here in Utah, which I love. 7. For the Purist: Kallari Chocolate Bar. This award-winning Ecuadoran chocolate is deliciously rich and smooth- and produced by a cooperative of indigenous Kichwa farmers in the Ecuadorian Amazon. And it’s simple full circle: profits return to the cooperative to support sustainable development, health, and education programs. 8. For Those Who Don’t Like Chocolate: want to stay calorie free but still tread lightly on the planet? Try to buy organic flowers. According to Pesticide Action Network commercial flowers (often produced in other countries) are the most toxic and heavily sprayed agricultural crops on Earth. 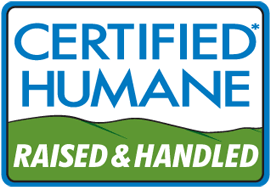 Alternately, look for Florverde Certified flowers- a rigorous certification which requires better treatment of workers and more sustainable farming practices. Want to see even more companies that are offering chocolate with a clean conscience? Business Week has a great review here. Got other favorites? I’d love to hear about them! Called “the nectar of the Gods” by ancient Greeks, honey is one of those surprising staples in your pantry that promises not just the elixir of beauty (from facial masks to soothing scars), but is a sweetly delicious, healing food. In my opinion, the magnificent alchemy that occurs as bees take nectar from flowers and (through interaction with enzymes in the bees saliva and digestion), transform it into honey is one of the sacred acts of nature. Ranging from colorless to a deep shade of caramel, from mild to richly complex in taste, think of honey like a fine wine; its color, flavor and aroma are uniquely dependent on the nectar of the flowers the bees visited, connecting you with a taste of a region. And with growing science behind its health benefits (research suggests raw honey helps kill h.pylori bacteria that cause ulcers, for instance) and the growing interest in foods plucked straight from nature, handcrafted honey is a refreshingly straightforward sweetener: Honey is a 100% natural, one ingredient, right-from-the-earth food: from hive to table, if you will. Yes, you can it eat! This is as pure as it gets. Dubbed by honey enthusiasts as “nature’s perfect package” most people are surprised to learn that these gorgeous, golden bees’ wax combs are cut straight from the hive, and are in fact completely edible. (When I was in college in Vermont, I remember “old timers” taking a knife, cutting a comb, and slathering both the comb and honey onto a piece of toast). While it may seem a bit waxy to some (in which case you can just chew on it until the flavor is gone, and then discard the rest), the comb has an intense honey flavor that is delicious; look for it at your farmers market or favorite natural foods store. A word of advice- just be sure to put it on a plate, as once it’s cut, the comb will start oozing honey. Many naturopaths and nutrition experts (myself included) suggest choosing raw honey for optimal health and beauty benefits. Raw honey is never strained, filtered or heated, and research suggests it’s loaded with many trace minerals, organic enzymes, antioxidants, plus antibacterial and ant-fungal properties that make it a powerful package of health. Plus, it’s rich origins means it’s loaded with more interesting taste and flavor. Raw honey is a shining example of “food as medicine”: Your grandmother’s home remedy of dosing you with a bit of honey for your cough, for instance, seems to have some science behind it: Honey has promising evidence as a cough suppressant, not to mention a favorite alternative topical remedy for cuts and scrapes, even as a home facial ingredient. Look for honey labeled “Raw Honey” in your favorite grocery store or on your next trip to the farmer’s market. If it crystalizes in your pantry over time, you can certainly enjoy it that way (it just means the glucose in the honey has precipitated out of the liquid), but if you prefer a more liquid honey, simply place the jar into a warm water bath and stir gently until the crystals dissolve. Caution: The American Academy of Pediatrics advises that children age 1 and under are not given and honey whatsoever, as it can potentially carry spores of the toxin Clostridium botulinum, raising the risk of infantile botulism. There’s been intriguing research looking more closely at one type in particular: Manuka honey. To be labeled Manuka, this darker, stronger flavored honey is harvested from bees who gather nectar in areas populated with (you guessed it) the Manuka bush, a type of shrub which grows in New Zealand. 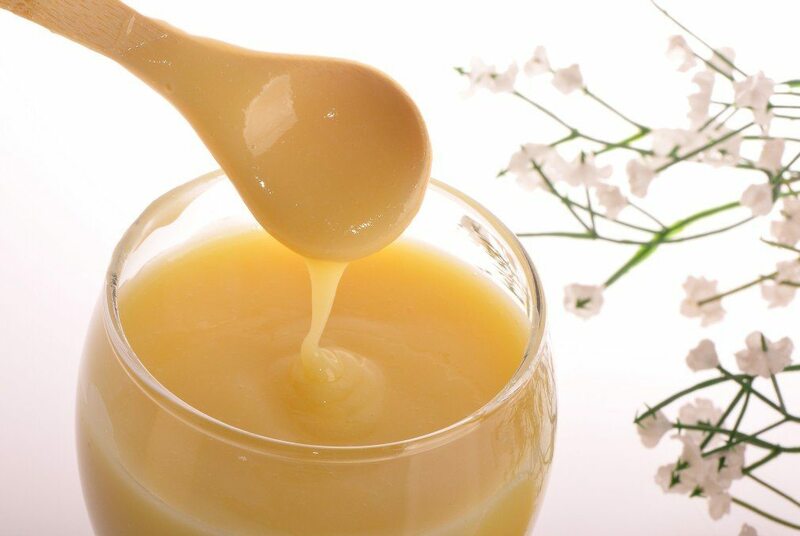 Manuka honey seems to hold particular promise in helping to treat burns, ulcers, gingivitis, as an anti-bacterial treatment, and has been the subject of several human trials. However, it is sometimes promoted to cancer patients as having miraculous anti-cancer properties; if that’s the case, proceed with caution and absolutely talk with your doctor before adding anything to your regimen. Consumed as a heath food around the world, this prized milky-white cream is rich in an array of nutrients, including B vitamins, amino acids, sugars, minerals and fatty acids. Royal jelly is actually a food secretion made by worker bees and is the exclusive nourishment of queen bees throughout their life. With a pedigree like that, it’s easy to see why it’s seen as one of the most prized elements to come out of any hive, and how it’s a logical leap to assume if it’s the “bees knees”, we should be eating it, too. So should you? Here’s my opinion: given its role in nature as a uniquely nourishing powerhouse for the bee kingdom it may indeed be a safe, nutrient rich addition to your diet if you choose-and if you like the results you see (if you see any, that is) when you start using it. Royal jelly has also spawned an robust online and supplement industry filled with inflated claims ranging from curing sexual impotence to balancing hormones, so proceed with caution. While there’s certainly some encouraging science (one of the strongest areas being in the promise of possibly lowering cholesterol) and many in the beauty industry claim it can stimulate collagen and be used topically or ingested to see numerous skin boosting benefits, remember that a diet rich in darkly colored fruits and vegetables, fish, legumes and whole grains is a proven path to supercharged health. So take the approach of “healthy diet plus royal jelly” rather than “drive thru plus royal jelly” as your strategy to success. Women should also note that because Royal Jelly may have possible estrogenic effects, (some research has suggested it may have an effect on fertility and menopausal symptoms), women with estrogen receptor-positive breast cancer should not consume royal jelly without first consulting their doctor. Also, if you have a history of bee allergies you may want to avoid. How Much Honey is Healthy? With all the buzz around sugars these days (are some healthier than others? Does natural or artificial make a difference? how much is too much? 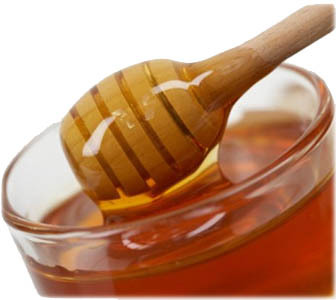 ), it’s important to remember that like any sweetener, honey should be savored in small amounts: the American Heart Association recommends that no more than 10% of your total calories should come from added sugars, which for the average American woman translates into about 100 calories a day, or just under 5 teaspoons of honey. For contrast, consider the average American currently consumes roughly 22 teaspoons of added sugar per day-more than 4 times as much! But honey does have some unique appeal: for one thing, this golden liquid is significantly sweeter than table sugar (about 25% sweeter), meaning you’re satisfied with less. This can shave calories off of your morning cup of tea, your drizzle on your oatmeal, or even the amount you need in a recipe when baking. Another plus? Honey has long been loved by athletes as a source of lower glycemic carbohydrate, which means it enters your bloodstream more slowly than other refined sugars, giving you sustained energy to power your performance. In ancient Greece, athletes feasted on honey and figs prior to the Olympic competitions; today my colleague Mitzi Dulan, RD, sports nutritionist for the Kansas City Royals, has her pro ballplayers eat honey sandwiches (with all natural peanut butter and whole wheat bread) for sustained energy prior to a game. And my four year old? Well, he just eats it cause he loves it. Despite feeling culinary eupohoria on my recent trip to Italy (I was in sheer heaven to be savoring in season delicacies like like white truffles and pumpkin risotto), I came away from the 3rd International Forum on Food and Nutrition with one looming thought: if oil was the big driver of the 20th century, your water footprint will be the driver of the 21st century. “We are entering a water economy,” said Barbara Buchner, Director of the Climate Policy Initiative in Venice. No matter how you slice it, the pie of resources is dwindling, with ever more people vying for resources. This theme resurfaced in many sessions, through different expert eyes, but all converging on the same point: the cost and availability of food and drinks is poised to shift dramatically in the years to come. The 20th century opened with just over 1.5 billion inhabitants, but it closed on the threshold of 6 billion. And if population projections are accurate, by 2050 (which is a mere 38 years away) there will be 9 billion people. What this means is that population growth, growing prosperity of billions, changing global diets, urbanization and biofuels are all increasingly connected to what Americans eat and how much they pay for it. A look at a map of World Water Stress and one quickly sees that water is going to be the defining issue for China and India, even the US- and that the era of limitless amounts of cheap water to produce food and beverages is rapidly drawing to a close. As people seek more sophisticated diets, the water footprint increases exponentially: Drinking tap water may be a straightforward trade (1 liter tap water requires 1 liter of water), but when you shift to bottled beverages the water footprint multiplies quickly: According to Buchner, the water footprint of 1 liter of bottled water is 5 liters of water, while the water footprint of 1 liter of soda is between 340-620 liters of water. As billions of people worldwide gain upward mobility to the middle class, they too are going want to buy these things, but where is this water going to come from? With this increase in demand but relatively fixed supply, the cost of water, experts warn, is set to increase dramatically. And food that used to be cheap (like a 99 cent hamburger) likely won’t be (as it takes 15,000 liters of water to produce 1 kg of beef, the highest of any foodstuff). To be sure, the global mishmash of cuisines and influences is exciting for the culinary world. Janet Helm recently wrote a fab blog on 2012 restaurant trends, noting that “cooking is at a crossroads where everything collides.” While foodies rejoice, it also underscores just how hyperconnected our food systems have become. The question is: how do we constructively, meaningfully engage Americans in the dialogue about diet, especially in light of the myriad other crisis the world is facing? Is a true paradigm shift even possible? And what are the best levers to push? (In America it seems like we should shift the upcoming 2012 Farm Bill to make the right foods cheap like fruits and veggies, as opposed to the wrong ones like high fructose corn syrup). But still I see hope. While the global diet is at a crossroads, through my nutrition lens I see that much of what makes for ultimately healthy eating is also more water wise. And as I wrote in my last blog, there are powerful shifts happening in the American food system for the better. -Eat whole unprocessed foods, drink tap water. -Enjoy a diet that has lots and lots of plant foods, with small amounts of meat and dairy products. -Get cooking! Turn off the TV cooking shows where food is a spectator sport, and cook. -Take less, waste less at the dinner table. As conference presenter Jonathan Bloom beautifully stated, “A clean plate makes for a clean conscience”. Obesity and Malnutrition are two sides of the same food production crisis-even in the US. Walking around Anywhere, USA, it’s often easy to see the obesity part of the problem, but the hunger piece can be more difficult to see. Ellen Gustafson, the Founder and executive Director of the 30 Project gave an electric session which explained how the twin issues of obesity and malnutrition are deeply connected to our current food system-even in the U.S. “Look at the state with the greatest obesity crisis, Mississippi...it’s also the state with the greatest hunger crisis in the US. That’s not a coincidence” Gustafson said policies aimed at “obesity” and “malnutrition” typically occupy two separate camps of people, resulting in a fractured approach as the two sides aren’t really talking with each other despite having many of the same fundamental issues at the core. Gustafson’s goal? To bridge those two spheres to more effectively drive change. I had a great interview with her today, and I’ll share the link as soon as it’s available. What you can do: Buy whole foods as close to the source as possible, support local food communities, and buy real food from real farmers as much as you can. And cook dinner! Key Takeaway #2: SOIL is the most significant resource we have, and it’s often overlooked as dirt. “Forests precede civilizations...deserts follow them,” said Luc Gnacadja, Executive Secretary of the UN Convention to Combat Desertification, in his opening remarks. “We need to change mankind’s historical paradigm of degrade, abandon and migrate; we no longer have that option if we are to feed 9 billion people by 2050.” While we often think of the brown matter that grows our food as “dirt”, soil in contrast is living biomass, teeming with micro-organisms the play critical roles, with a greater capacity to store water and nutrients. Every year we lose some 75 billion tons of fertile soil every year, yet soils are the most significant non-renewable resource we have for ensuring water, energy and food security, plus build resistance to climatic shocks. In other words, everything that’s coming down the pike for a hyperconnected, hyperpopulated world. What I loved about this point is that vibrant, thriving soil is also key to vibrant, thriving food that is brimming with the maximum amount of antioxidants, phytochemicals and other nutrients critical to optimal health. As any farmer will tell you, food is only as nutritious as the soil in which it’s grown. What you can do: Support soil restoration and reforestation projects in your community. For birthday gifts, plant a tree in someone’s name. Buy food from farmers, co-ops and support organic; many organic companies have policies that actively work to continuously improve soil quality (like Earthbound Farms LINK). Key Takeaway #3: Re-allocating just 5% of our food waste could end US Hunger. Jonathan Bloom, author of American Wasteland and creator of the eye-popping blog www.wastedfood.com shared that stunning stat in one of the morning sessions. But rather than thinking that means we’ve almost put an end to hunger (see Takeaway #1), to me it highlights just how much food we’re actually wasting. In the U.S., a full 40% of food is wasted. What does that even look like? “The food wasted in one day in U.S. would fill the 90,000 seat Rose Bowl Stadium”, said Bloom. Why do we waste so much? Food is cheap in the US, and it’s actually never been cheaper- the average American allocates less than 7% of household spending, all time household low (Italy is 15%). And we don’t tend to value what we don’t spend a lot on. Food is also abundant: the United States produces about twice as many calories per day as the average American needs. And we see food everywhere, from the mall to the gas station, which creates a sense in our minds that we don’t have to be careful of our food, there’s plenty more. Of course, these are many of the same reasons Americans are overeating so much food (which drive obesity and chronic disease) in the first place, so Jonathan and I seemed to agree a lot. And unlike starving-children guilt trips of old, bringing your plate to better portion alignment is a wise strategy in every sense: As Bloom beautifully stated, “A clean plate is a clean conscience”. What you can do: Invest in the best you can afford, and enjoy smaller portions. Avoid “Buy 1 get 1 Free” “All You Can Eat” and other food buying incentives if you won’t be able to finish your plate..this often contributes to waste. Instead of buying highly perishable fruits and vegetables (which are some of the leading items to spoil, according to research), buy frozen fruits and veggies instead. If you’ve ever spent even 5 minutes in the same room with me, you find out pretty quickly that Italy runs through my veins. Or more accurately, through my heart and my stomach. While technically I’m 100% Irish, after living in Florence for 2 years and eating my way through the rest of the country, I knew I wanted to spend my life exploring the connections between health, nutrition, and the pleasures of good food at the table. Which is why I’m so pleased to be partnering with the Barilla Center for Food & Nutrition (BCFN) to help move forward the dialogue about the most critical challenges of our time: Nutrition, Children and Sustainability. We all know that economic growth, globalization, and the sprawling cultural influence of a Western diet are bringing about a change of eating habits on a worldwide level, with child obesity rising at an alarming rate. So whether you work in healthcare, or are a mom committed to raising healthy kids, I hope you’ll tune in to this groundbreaking webinar that will move the dialogue forward about the connections between children’s health and planetary health. What will the Barilla Center for Food & Nutrition be covering in the webinar? 1. How to simplify the issues in a way people can understand. One of the best tools I’ve seen in a long time to help people truly see the connection between the ecological footprint of different dietary patterns is their The Double Food Environmental Pyramid model. Having spent almost a year researching my book and trying to explain these connections, it’s a refreshingly simple but useful tool for developed countries to understand the links between diet and environmental impact. 2. Who are the players, and what are their roles? According to the BCFN, healthy growth and development calls for an integrated approach between the family, school and pediatricians for educating new generations on the relationship between food, health and well-being during childhood and adolescence. Of course, nutritionists are on that list as well! 3. What is the responsibility of agriculture and industry? There’s been a growing call for accountability of agricultural and food industries to do their part, with initiatives and product lines that are aligned with the correct nutritional practices for children, as well as long term sustainability. What’s happening globally in this area? If you can’t tune in, I hope you will follow the discussion on twitter at #SustainOurChildren or @BarillaCFN. Or check back here on Wednesday, as I’ll be posting another blog about what we all learned. Do you cop to having a short fuse when it comes to dealing with life’s everyday stressors, such as your boss, your spouse, or even your kids? Do you reach for food or caffeine during the day in an attempt to feel calm, to find a jolt of energy or a moment of bliss? But above all else, do you just really crave a better mood? I recently did a segment on the Dr. Oz Show that tackled this topic. If you want to feel significantly less cranky and more able to sail through your day, read on. While good habits such as eating breakfast every morning and regular meals and snacks throughout the day form the cornerstone of an energized outlook, science has increasingly revealed the vital ways in which our food impacts our mood. And it may surprise you that some of the best weapons to help cure crankiness can be found in your local grocery store. These 5 foods will help your mood in two ways: first, they deliver several key nutrients that science has found play a vital role in supporting brain chemistry to reduce the risk of depression and help improve the quality of your sleep. But they do something equally important as well: their powerful combination of vitamins, minerals and antioxidants help you build up your energy and capacity to handle life from your body’s deepest levels (your cells metabolic and energy pathways), rather than that quick burst of stimulation from a sugar or high caffeine fix that ultimate leaves you feeling cranky or tired. Try including them as part of a delicious new happiness routine. 1. Salmon with Hemp Seeds and Radish Sprouts. In order for your brain to function optimally it needs to have the right nutrient building blocks available, and omega-3 fats are one of the most important when it comes to boosting your mood. The brain is 60% fat, and particularly loves omega-3 fats, but most Americans get far too little omega-3 in their diet. The problem with that? Growing evidence suggests that consuming inadequate amounts of omega-3 fatty acids is associated with depression and poor moods. Fatty fish like salmon is one of Nature’s richest source of omega-3 fats, so for a mood lift enjoy fatty fish 2-3 times each week. Odds will be you’re in happier company, as studies have found that people who infrequently eat fish are more likely to suffer from depression. For an extra “heaping of happiness”, coat the salmon with crushed hemp seeds (available in the natural foods section of most grocery stores) and top it with a radish sprout salad: both the seeds and the sprouts are rich in vitamins, minerals and omega-3 fats to further bolster mood, brainpower and immunity. By eating this way, you’ll enjoy a double brain benefit, too: not only do foods rich in omega-3 fat help fight crankiness and improve your outlook today, they help you maintain a robust memory and significantly reduce the risk of developing dementia as you age. 2. Mushrooms Exposed to UV Light . Vitamin D is another key part of “mood maintenance” because it helps regulate the activity of the brain’s neurotransmitters (serotonin, melatonin and dopamine) which have have a profound impact on mood. Studies have found the likelihood of having depression is significantly higher in people with deficiency in vitamin D compared to those who have normal levels. And chances are, you or someone you know might be deficient and not even know it (a blood test is required); by some estimates over 50% of Americans are deficient in vitamin D, making it a critical component in a crank-proof diet. 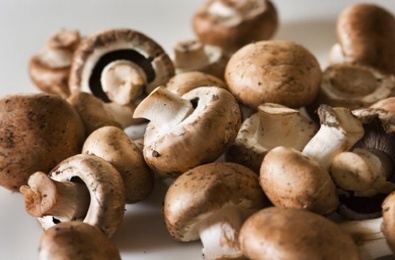 While it can be difficult to meet the RDA for Vitamin D through food alone (which is 600 IU for people ages 19-70), one fantastic food that has recently come to a supermarket near you is Vitamin D-packed mushrooms. These are mushrooms that have been exposed to UV light, which naturally boosts the vitamin D level, so that 1 cup of these mushrooms packs 100% of the RDA (look for this on the label). Serve these mushrooms over couscous for an easy and delicious dinner; the couscous is rich in selenium, another nutrient that has been linked to improved mood. Savor a handful of dried tart cherries before you turn in for the night and you’ll set the stage for a better mood when you wake up. Tart cherries are rich in a hormone called melatonin, which acts as a natural sleep aid by improving quality of sleep. As we age, our bodies’ natural ability to produce melatonin decreases (one reason why seniors can find it harder to sleep soundly), and things like stress or artificial light can also lower our body’s melatonin. And here’s an added bonus: cherries’ powerful bundle of antioxidants helps protect your brain from free radicals, which enables your brain chemistry to be optimized for a good mood. This one’s fun as it is tasty! Amaranth is a delicious “new ancient grain” to try if you haven’t yet added it to your shopping list. This supergrain is loaded with antioxidants, minerals, fiber and iron, and was considered a life sustaining food of the ancient Aztec and Inca cultures. Whole grains are a key part of any crank proof diet, as the carbohydrate in whole grain helps raise levels of the brain’s feel-good neurotransmitter serotonin, which acts as the body’s natural anti-depressant. The fiber in amaranth also helps keep blood sugar stable, so you feel more alert and energized longer. This is a key reason to choose whole grains over refined grains and sweets when looking for a mood boost, for those sugary treats often trigger blood sugar to spike and plummet, leading to crankiness and faster fatigue. Look for amaranth in the bulk section of your grocery store or in the natural foods aisle. For a fun twist, try amaranth popcorn: simply put a dry medium skillet over medium high heat, and when hot add 2 Tbsp. amaranth seeds: COVER QUICKLY WITH A LID so it doesn’t pop everywhere! Gently shake back and forth, and the grains will quickly pop into “micro popcorn” in about 10 seconds. Pour into a dish and repeat with another 2 Tbsp. Dust with cinnamon for an added antioxidant and flavor boost. 5. Medjool Dates and Cocoa. Nearly all of the cranky viewers Dr. Oz and I spoke with sought out sweets at some point during their day; after all, who doesn’t like to feel that quick “pick me up” that sweetness can bring? 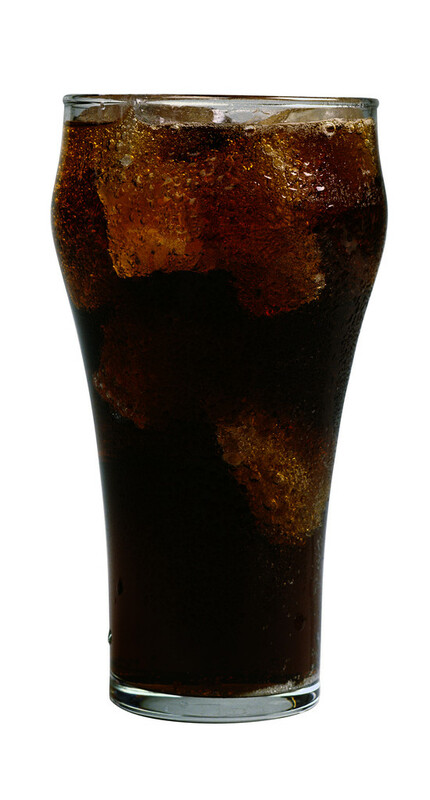 The challenge is the sheer amount most of us are eating: Americans consume more than 22 teaspoons of sugar each day, According to a 2004 National Health and Nutrition Examination Survey. 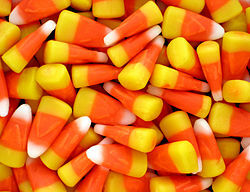 While the initial rush of sugar can indeed perk you up, it ultimately leads to the crankiness of that inevitable crash. A sweeter fix for your sweet tooth is to try my Decadent Chocolate Fix, made from just 3 superfoods: Avocado, Medjool dates, and cocoa powder. Aside from all the health benefits of cocoa for the cardiovascular system (mainly in the form of flavonoids) the reason cocoa often gives an instant feeling of happiness is due to the rush of dopamine that triggers the brain’s pleasure receptors, and endorphins which give a feeling of a natural high. As with any sweet treat, even this one should be eaten in modest portions because it is high in calories, but at least you can go to the dark side in a delicious, healthy way. Place all ingredients in a food processor or Vitamix and purée until smooth. Add 1-2 tsp of water to combine if needed. What foods help you crank-proof your diet? I'd love to hear about them! 1. Discover foods not available in the grocery store. Baby heads of tender lettuces, a rainbow of heirloom tomatoes, donut peaches-all of this delicious nuance of nature is lost in bigger supermarkets. 2. Take home a truly tasty tomato. Honestly-when you sink your teeth into these perfectly sweet, juicy, tasty gems you will ask yourself “why bother?” with any of those mealy, out of season pucks you get the rest of the year. And you’ll pack over 50% of your daily dose of vitamin C in one hearty tomato. 3. Retire a picky eater for a day. Get kids tasting! Kids love tasting their way through markets. Get them excited about new things to try, then carry on the adventure by encouraging them to choose some produce bring home for dinner. Research shows us if kids are involved in choosing, and feel a connection to growing their food, they are more likely to try it. 4. Put a face to your food. It’s a perfect chance to ask your farmers all the questions you want to know about your food-like how was it produced? Especially with many smaller farmers who choose not to go the costly route of USDA Organic certification, it’s a great opportunity to get the lowdown. 5. Buy a beautiful plant you know will grow locally. Because it was raised locally it is more apt to fit your states climate and water status-and you can ask the master gardeners who are selling them. 6. Keep your dollars in your local economy. When you shop at your farmers money those dollars stay in your community instead of being siphoned off to larger regional and national outlets. For more reasons, tips & tools visit: http://lancaster.unl.edu/food/ft-jul-10.shtml. Looking for more farmer's market resources? Check out the links below! Hitting the road this summer? Whether a day trip to the beach or an extended road trip to a far flung relative, when your vacay crams in the car, it’s even more challenging to eat something you can feel really good about. But with new research this month finding that Americans consume 25% of their calories from “snacks” (which weigh in at a whopping 580 calories total) summer dashboard dining habits matter, especially if a bathing suit is in your future. Here are 6 super convenient, tasty lean and green Sustainable Snacks that kids and parents alike will love-that will also have you SAVING Green when as well. My criteria? They had to be eco-friendly, healthy, tasty and fun. And “car picks” must withstand searing hot car temps for a day or two- and couldn’t require fussy utensils or other tricky setup that seems impossibly difficult at 70 miles an hour. 1) Justin's Nut Butter Packs. These high protein, high satiety and uber flavorful nut butter packs are portable beyond compare. And because Justin created his own unique method of grinding his masterpieces,these healthy summer snacks taste richer, and, well, nuttier than any other nut butters on the market (The almond maple butter and honey peanut butter are my kids faves). Most are USDA certified organic. Best of all, they can stand up to searing summer heat (at least, for a few weeks), making them a bit more durable. 2) Baba Ganoush. Last year I blogged about these wonderful falafel balls with Greek yogurt and pita - I'm still on a Mediterranean kick with this fantastically portable Baba Ghanoush by Blue Moose of Boulder (available at Whole Foods, but look for any brand in the chilled fancy food area of your grocery store). Tote along some whole wheat pita (I cut mine up with a pizza cutter into wedges and then put back into the plastic bag for the trip, so kids and grownups can just help themselves). Add some bagged carrots and you've got 2 veggies and a whole grain for snacking! Or you can always make your own, with a delicious recipe like this one. 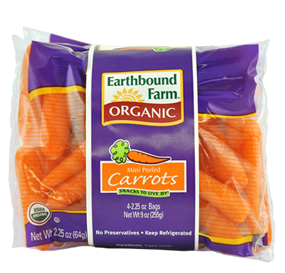 3) Earthbound Farm Organic Snack Packs. For the perfect lean and green overlap, swing by your local farmers’ market before you go and fill a small cooler with amazing edible eats like seasonal peaches, plums and hydrating cantaloupe. But if you’re on the road already, many supermarkets now carry Earthbound Farm Organic Snack Packs. These snack packs come in a variety of fruit and veggie options, and are not only organic, but are fantastically convenient for car eating as well. Coming in varieties ranging from apple slices to carrot snack packs, these are the perfect way to keep fruits and veggies in the mix while on the road. For a double bonus you can even try dipping the apple slice snackers in a pack of Justin’s Nut Butter, or bring along a small container of hummus for the carrots (I love reusing a container from my kids’ Laptop Lunch for this purpose). 4) A Liberty Bottleworks Water Bottle. I LOVE these bottles! Liberty Bottleworks’ water bottles are the ONLY Made in the USA 100% recycled bottle, totally BPA free and with a recycled lid to boot. Fill them with water and stay cool for hours while you sip sustainably- after recently meeting the company founder on a fieldtrip to Rodale, I am a convert. Their full circle commitment to job creation and keeping iconic brands made America (many of the other top reusable water bottles are made in Europe or China), had me feeling good at the deepest level that this company embodies the way forward to a more sustainable future. And the best part? Not only will the generous size (and splash proof design) remind you that ZERO CALORIE drinking is key (that new snack study found Americans spend 85 minutes a day drinking liquid calories, a 90% increase from 2006) , the artwork is to die for gorgeous and innovative. 5) Cucumber. Cucumbers are one of the most refreshing, hydrating and economical summer fruits around. They are loaded with water, to help keep you cool, but their skin also contains silica, a mineral that keeps your own summer skin plump and glowing. Because we all have enough to pack and prep when hitting the road (or because I’m just lazy), I will either pack 1 giant hothouse cucumber (that I’ve washed well), hacked into 4 big pieces...or else a bunch of individual smaller cucumbers (those cute pickling ones are the best) from the farmer’s market. Kids and adults love nibbling directly from it, and it’s one less container I need to wash! 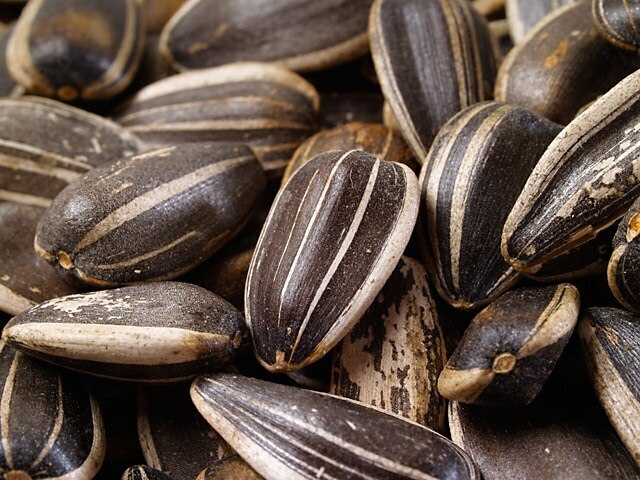 6) Sunflower Seeds. We have several “salty/crunchy” types in my family, but rather than digging into a bag of chips large enough to drown my firstborn, I tote a mix of roasted sunflower and pumpkin seeds instead, which are packed with important minerals like zinc and magnesium, their combo of heart healthy fat, fiber and protein is the winning trifecta to keep hunger at bay all the way “until we get there”. On the run? These powerhouse seeds are easy to find at most convenience stores and gas stations as well, making your healthy on the road snacking a breeze. What are your favorite sustainable summer snacks? I would love to hear about them! (In full disclosure, I received free samples from Justin’s Nut Butter and Liberty Bottle Works when I asked them for info about their products). Last week I had the amazing opportunity to visit the Rodale Organic Farm and Institute in Emmaus, PA - my colleague Ashley Koff, RD and I invited 40 RDs to join us to see firsthand what’s the state of the science when it comes to conventional versus organic agriculture, and how it relates to our mission as nutrition professionals to help Americans Eat Right. Since many RDs (myself included) never actually stepped foot on a farm during our formal training (hovering in the food lab and the clinical setting instead), with the massive shift taking place in the conversation around food in America, we wanted to provide a forum for RDs to hear directly from some organic and sustainability pioneers. So we also invited some wonderful, visionary companies who have shown that the 3 P’s (People. Planet. Profits.) are not only possible, they are downright delicious. Stonyfield Organics, Nature’s Path Organic, Honest Tea, Liberty Bottleworks and Mary’s Gone Crackers provided an amazing organic food and drinks throughout the day, and spoke with us about the steps they’re taking to bring organics and clean eating/drinking to more people, with more integrity, at a lower cost than has ever been seen before. A steamy 100 plus degrees in NYC, we bolted from the humidity for the haven of the farm. Bustling with trees and songbirds, chickens pecking about the rich green lawns and livestock lolling on the grassy hills, Rodale’s 333 certified organic acre farm felt as good as you can get when it comes to imagining what your food comes from. What did I learn? That you don’t spend much time on an organic farm before you get to the topic of dirt. Jeff Moyer the farm manager/director at the Rodale Institute for more than 28 years, and past chair of the USDA’s National Organic Standards Board, served as our guide, and told us that the best farming should be based in biology, not just chemistry. “As humans, we’ve learned how to grow great looking vegetables with chemicals’, he says. “But the real key lies in the soil: If it isn’t in the soil, it can’t be in the plant. If it can’t be in the plant it can’t be in you,” he said. Rodale Institute’s flagship research project is the renown Farming Systems Trial, America’s longest running side by side comparison trial of conventional versus organic agriculture. 1) Organic is just as productive as conventional: The Farming Systems Trial has found that organic agriculture is equally productive to conventional. Corn yields over 27 years of the trial, for example, were equivalent between the organic and conventional systems. 2) Organic soil sequesters more carbon into the soil, making it a carbon sink of sorts. In contrast, the conventional plots experienced a net loss of carbon-making organic agriculture a powerful tool, immediately available to us, to help keep our climate from warming. 3) Organic soil outperforms conventional in years of drought. In 4 out of 5 years of moderate drought, the organic systems had significantly higher corn yields (31% higher) than the conventional system.With water predicted to become the next oil, this is an advantage whose monetary value will only make organics more cost competitive. Of course we need evidence based science, delivered in ways that resonates with consumers, to create momentum for change at the policy and consumer level. But my favorite insight of the day turned out to be purely anectdotal: Jeff said that while researchers need GPS to distinguish the somewhat crazy patchwork of conventional and organic plots from one another across the Trial, the deer and gophers seem to know exactly which are which; they only eat from the organic ones, every time. Now that’s something that even my kids would instant connect with. While our brief day left me craving more time to walk the farm and definitely to nibble from the Organic Pizza Garden ("a great way to connect kids to farming”, Jeff mused), it also got me inspired: The most powerful lever YOU can press in the food system to create change is surprisingly simply: Demand Organic. If the consumer creates demand, the ripple effect will be faster on personal and planetary health than any steps politicians or governments are likely to take. And many companies, such as those who sponsored our day, are making it more affordable and easier to eat and drink organic on the go than ever before. Need some guidance? Here’s a Great Primer to Shop Organic on a Budget. What can RDs do to help make buying organics easier for you? I’d love to hear from you. I know I’ve been on a fish kick lately, but because June 8th is World Oceans Day, because the newly minted USDA Dietary guidelines recommend eating 2 servings of omega-3 rich fish each week, and because I was recently invited by the Norwegian Seafood Council to visit the stunningly beautiful country of Norway (one of the world’s largest suppliers of both farmed and wild fish) to see their Norwegian salmon farming operations, I’m still hooked on it. As I recently blogged, fish is awash in challenges for many reasons, but I came away from my trip to Norway with some refreshingly simple takeaways. Given that this is a blog (read: short and sweet) and not a research treaty, I’ll just boil down the key issues that gave me hope and confidence about what I saw. (Please note: my comments only relate to what I experienced in Norway, and do not constitute a broad brush stroke of all farmed salmon by any means). Norway is as stringent about good clean fish as Europe is about good clean food. Call it the “halo effect” I feel for Europe when it comes to defending their food supply from frankenfoods; I admire Europe for how much much more vigorously they defend their food (consider that the controversial milk hormone rbST is banned in the EU, and that strawberry sundae you buy at a local fast food chain in the US has Red Dye #40 in it, while in Europe it contains beet juice extract). I was relieved to discover the same rigor extends all the way north to those chilly Norwegians fisheries as well. I (as did many of you) had several questions prior to my trip: Here’s a quick summary of the facts of what’s happening in the fjords of Norway. No GMO Norwegian salmon. The mere question of it on my part was quickly dismissed as “not an option at all”, when I asked Livar Froyland, PhD, of Norway’s National Institute of Nutrition and Seafood Research. The salmon they raise are genetically identical to the Norway’s traditional salmon populations. No GMO in the salmon feed. “We wouldn’t eat it, why would we feed it to our fish?” he asked me, as we were standing out in the misty platform of the fish farm. (I had a hard time thinking John Stossel might get a similar comment when checking out our poultry or meat industry). Also, there are no hormones or antibiotics in the feed. Antibiotic use has been dramatically reduced. (compared to 10 or 15 years ago). This has been accomplished through the use of vaccines instead. While you have to decide how you personally feel about vaccines, it’s worth noting the organic livestock & poultry in America and Europe are also treated with vaccines. Sea lice? Managed organically. Norway now has a program which uses “cleaning fish” in the pens which keep the salmon free of sea lice. Best practices. According to the World Wildlife Fund, Norway is ranked number one in the world when it comes to compliance with the United Nations Food and Agriculture Organization’s (FAO) code of conduct for responsible fishing. Things like managing waste, fish pen conditions, and relationship to surrounding ecosystems are all included with this ranking, and Norway comes out on top according to the UN. Fish feed. This one is still a work in progress, and admittedly is one of the challenges facing aquaculture (and livestock feeds) worldwide. Currently, about 35% of the fish feed comes from a combination of fish oil and fish meal, and the remainder a combination of grains, other oils, vitamins, etc. The risk of NOT eating fish far outweighs the risk of eating fish. Of course parents everywhere just want what’s best, safest and healthiest for their kids (I have a 4 and 5 year old and feel the same way) but fish is one exception when it’s very possible you’ll be doing more harm than good by leaving fish off the shopping list. With the 2004 study sounding the alarm that farmed salmon contained 4-10X more PCBs and dioxins than wild, the media was whipped into a frenzy and the nuance was lost as the takeaway become “avoid eating farmed fish at all costs”. Missing from the story? What are the risks of not eating fish?” Turns out they are actually much, much more significant, especially for pregnant women, where skipping fish potentially deprives the developing brain of vital nutrients. (The growing brain loves DHA, and DHA is 50% by weight of some brain cells. DHA increases 300-500% in an infant's brain during the last trimester of pregnancy). In fact, a 2007 study found that the children whose mothers avoided fish had almost double the risk of a low IQ by age 8. Also important: the children who did the best in the IQ testing were those whose mothers ate more than 12 ounces of fish per week while pregnant. The bottom line is eat more fish, especially more omega-3 packed fish, period. The benefits far outweigh risk for almost everyone-if you have children or are thinking of becoming pregnant, government advisories (avoid shark, tilefish, swordfish and king mackerel) are sound guideposts. Frankly, a much more important thing to avoid during pregnancy is pesticides on produce, which recent studies have connected to lower IQs in children. Wild Alaskan Salmon is amazing, but we need other options too. While I typically cite wild Alaskan salmon (especially if you live on the west coast), as the leanest & greenest choice you can make, the reality is that there simply isn’t enough salmon swimming right now for every American to enjoy wild Alaskan salmon twice a week for the rest of their lives. And if the controversial Pebble Mine project happens up in Bristol Bay, we might need a backup plan for what we tell families to put on their table-think of the Gulf Oil spill and you’ll know exactly what I mean. Few, if any, seafood options (including salmon) come with zero health or environmental considerations, but Norway has done a world-class job of linking responsible fisheries with ocean preservation and food security-two of the biggest challenges facing the world in our lifetime. And remember that the science suggests that fish, even farmed fish, is always a better choice for dinner, from both a lean AND eco-friendly standpoint, when compared to other staples such as beef or pork. We absolutely love farmers in America-is it possible that some “farmers” of the ocean could love their fish, their sea, and a commitment to sustainability as much? American farmers these days are akin to civic rockstars. Meeting these fish farmers, whose Nordic ancestors have literally been working in, eating from and managing these fjords for millennia, who told me proudly that “they could tell which fjord the sardine came from just by the taste”, got me thinking: might some fish farmers in the world be just as committed to ocean health, sustainability as their land locked cousins, equally proud to bring you “from fjord to fork? After all, humans from Hawaii to Japan have actually been farming fish for millennia; can the best of today’s fish farmers play a critical role in helping to preserve the ocean and still feed our planet’s exploding population? I think yes. Next month, I’m on to vegetables! It’s Earth Month! Time to enjoy the green shoots of spring that are emerging, which not only reminds us of fresh starts and change, but also of the earth’s amazing capacity to renew itself. It’s also starting countdown to summer-which mean, yes, swimsuit season, shorts, and all that other exposed skin. What better time to make some lean and green changes that are both earth and girth friendly? We’ve compiled 14 things YOU can do to celebrate the environment and green your diet for Earth Day (April 22nd)- some you may have heard of before, some you may be doing already, and some may be completely fresh ideas for you-but I hope you’ll find inspiration as well as specific how to information in the tips below. You’ll emerge from the challenge looking and feeling your best as you spring into the new season! Got other new ideas? I’d love to hear them. Send me an email at kate@kategeagan.com 1) Go Vegetarian Two Days a Week. This is the number one thing you can do to go green and get lean. Did you that going vegetarian one day a week creates a greater environmental saving for the planet than switching to an all local diet? This is good news for those of us living in parts of the world with short growing seasons. Plant rich diets are the fastest and easiest way to immediately start eating in a way that’s healthier for you and the planet. Think Mediterranean: pack your plate today with plant foods (fruits, vegetables, beans, nuts, seeds), and serve smaller portions of animal products. 2) Switch to Organic Milk. I’m often asked where people can get the biggest bang for their buck when it comes to changing their grocery list to be leaner, greener, and better for our food system. Organic milk is one of the most powerful purchases you can make on all fronts, and research continues to show that it is even more nutrient rich than conventional milk: Organic milk has been found to contain 70-240% more omega 3s, to have a healthier omega 6: omega 3 ratio, to contain up to 50% higher levels of vitamin E, 75% higher levels of beta carotene, and 2-3x more antioxidants. It also has less of the artery clogging stuff- a new study found organic milk contains 20-40% less artery clogging saturated fat than conventional, with significantly higher levels of healthy omega 3 fats. And if you're a nursing mother, consider this; when mothers who breastfed chose organic milk instead of conventional, their babies enjoyed 36% higher levels of the heart healthy essential fatty acid CLA. When you choose organic milk, you’re also saying no to added hormones, antibiotics, pesticides, and other chemicals in your milk. This is especially important if you have children, whose bodies are more vulnerable to toxins and chemicals because of their lower body weight and continuous growth. Organic milk also has a profound ripple effect on the health of farms: More than 200 acres of farmland is used to grow food for livestock. Choosing organic milk helps ensure this land is free of pesticides and other toxins. With the average American drinking more than 17 gallons of milk a year, that’s over 5,100,000,000 gallons of milk we can potentially change for the better; better health for our families and our communities. 3) Serve a sustainable snack. Snacks are a bigger part of our grocery carts, pantries, and days than ever before-about 23% of America’s calories are coming from snack foods. Eliminate any single serving, highly processed "snack food" that you find in those inner aisles of the grocery store-and reach for Mother Nature's power packed snacks instead: my litmus test? It has to be a ONE INGREDIENT food-as close to its natural growing state as possible-this is the ultimate in nourishing yourself with food that has a high nutrient value to lower cost (remember, processing food creates profits, and adds about 30% to a food’s carbon footprint) and helps reduce all that packaging too. If you have an organic packaged snack that you love, try to buy in bulk and pre-portion yourself into reusable single serving bags to minimize all the packaging (and higher cost) of single serving bags. 4) Learn The Most Important Labels. With a sea of greenwashing claims at the grocery store these days, 3rd party certification is one of the strongest indicators ofindependently verified (as opposed to manufacturer claims) environmental stewardship. Look for USDA Certified Organic, Food Alliance Certified, Marine Stewardship Council (for seafood), Rainforest Alliance Certified, and Fair Trade Certified as pointers on your path to more sustainable shopping. Try using the super easy Label Lookup (from the NRDC) on your iPhone to help you see which labels have the most rigorous standards behind them next time your grocery shop. 5) Pass By the Palm Oil. Did you know that after China and the U.S., Indonesia is the planet’s 3rd largest emitter of greenhouse gases? That’s because of all the deforestation happening there to plant palm oil plantations—much of which ends up in cheap processed food here in the US. To-boot, palm oil is loaded with artery clogging saturated fat. Read your labels and try to avoid anything that contains palm oil. At the very least, choose brands that contain either organic or Sustainable Certified Palm oil. Here are some of my faves: Nuts (almonds, walnuts, pistachios) are lean and green superfoods, and will pack protein & fiber (key for staying power) as well as heart healthy fats. Reach for fresh seasonal fruit, or dried fruit, Greek yogurt, edamame, air popped popcorn, hummus, olives, or a combo of hemp, pumpkin & sunflower seeds. 6) Get Hooked on Sustainable Seafood. Download the Seafood Watch app for finding sustainable and localseafood on your smart phone. Love sushi? Download the Sushi Guide to find sustainable sushi nearby, or just use one of the pocket guide PDFs to check out your specific region for sustainable seafood. Have you found“Best Choice” or “Good Alternative” seafood in your area? Now you can share the location with others using Project FishMap on your smart phone as well! 7) Put A Green Sheen on Your Night Out. Restaurants are one of the most energy-hungry ways to get your meal. According to Pacific Gas and Electric’s Food Service Technology Center, they use almost 5x as much energy per square foot than any other type of commercial building. Support those restaurants that are making every effort to reduce their impact while still providing you delicious cuisine by using www.dinegreen.com - choose from over 275 Green Certified Restaurants in the United States. 8) Wake up with Organic Coffee. This one change has many perks, as it can immediately impact your world; For most households, that daily coffee drink is one of the most direct connections with the “cooling lungs” of the planet,-the rainforest. Choosing only certified coffee ensures that rainforest is being sustainably managed. Consider that if just 1 household switched to certified coffee for a year, it would help protect 9,200 square feet of rain forest. Savoring your coffee at home, rather than buying a latte to go, is also more eco-chic; did you know it takes 200 liters of water to bring you that Java to go? 9) Say Goodbye to the Bottle. Bottled water is 2,000 times more energy intense than tap water. And experts estimate the annual petroleum used to make plastic bottles for thirsty U.S. consumers could fuel 100,000 cars annually. And then there’s the fact that it takes more than 2x the water that’s actually in the bottle just to make the bottle itself. Tap your tap instead – invest in a good filter at home like those from Brita. 10) Compost Your Food Waste. Here’s a great way to green your diet without changing your shopping habits- try to minimize food waste by serving smaller portions, reusing leftovers, or even giving some to Fido if he can handle it. Food scraps are about 12% of a family’s household waste, and emit powerful warming gasses when they break down in landfills. But in your backyard, it’s a whole different story--regenerate them into nutrient-rich soil instead! Visit www.CleanAirGardening.com to get a chic compost pail for your countertop. 11) Grill up a Grass-fed Bison or Portobello Burger. Instead of a beef burger, opt for a grass-fed bison or mushroom burger. Grass-fed bison provide a healthy dose of omega-3 fats, has significantly less saturated fat per bite, and on average packs about half as many calories as a hamburger. Plus they emit much fewer green house gases than animals corn fed on a feedlot-and can be a powerful win/win for those who want to have their beef and eat it too. And portabellas? Super low in calories, rich in selenium, and super eco-friendly on all fronts. Marinate for 30 minutes prior to grilling for a succulent, juicy burger that will get raves from the carnivores and vegetarians alike. 12) Pick a Peck of Organic Potatoes. Ok, so I don’t know how much a peck actually is, so let’s just say buy organic potatoes. Why? Bang for the buck in every way-lean, green, and clean. Roughly one-third of America’s veggie intake is potatoes- and it is by far the top vegetable consumed by our children. Whether as french fries, mashed or baked, potatoes are an American diet staple. With the average American consuming 142 pounds of potatoes a year. Plus, with RDs often encouraging the public to eat the potato peel as well (for all the fiber and nourishment it provides), given the science it’s especially critical to choose organic. America’s favorite vegetable and most popular tuber lands near the top of the Environmental Working Group’s Dirty Dozen List - it has one of the highest pesticide levels of the 43 fruits and vegetables tested. Unfortunately, even a good scrubbing isn’t likely to completely remove the chemical residues; a 2006 USDA study found that 81% of potatoes still contained pesticides even after being washed and peeled (potatoes are the ONLY peeled vegetable on the Environmental Working Group Dirty Dozen list). Not only can root vegetables like potatoes absorb like herbicides, fungicides and pesticides from the surrounding soil while they are growing, but potatoes are often sprayed with fungicides again after harvesting to prevent them from sprouting. Given that it’s a daily staple on America’s plates, in particular our children’s diets, switching to organic can have significant reduction of pesticides and fungicides. The good news is that potatoes are one of the most cost-effective veggies to swap to organic-with organic spuds only slightly more (.60-$1.50 more per pound) than conventional potatoes- about the equivalent of just one iPod download. 14) Join a CSA. Community supported agriculture is one of the pillars of healthier and more sustainable eating. Already done this? Then give yourself a green star- if not, supporting local produce is an easy way to start greening your diet and boosting your health (it encourages you to eat seasonally, which boosts your exposure to a wide variety of foods picked at the peak of perfection-which means at their most nutrient packed!) Check out www.localharvest.org to join and to start putting a face to your food-the farmer who grows it. “Health is more than just the absence of disease. Health is wholeness and balance, an inner resilience that allows you to meet the demands of living without being overwhelmed. If you have that kind of resilience, you can experience the inevitable interactions with germs and not get infections, you can be in contact with allergens and not suffer allergies, and you can sustain exposure to carcinogens and not get cancer. Optimal health should also bring with it a sense of strength and joy, so that you experience it as more than just the absence of disease.” - Dr. Andrew Weil, 8 Weeks to Optimum Health. Your health is a dynamic, flowing state-its abundance or its absence will have a profound ripple effect across your whole life - your level of performance, your level of engagement, and most of all, your sense of joy and purpose in the daily actions that make up your life. With that in mind, here are 5 Habits that I’ll be following this year as a blueprint to HEALTH. Secret #1: Eat Food. Mostly plants. Michael Pollan said this beautifully and perfectly in his wonderful tome In Defense of Food: An Eater’s Manifesto. Eat real food that’s minimally processed or refined. And following a plant based diet is not only greener, it’s a hallmark of one of the healthiest diets on earth. Pack your plate with plant foods (fruits, vegetables, beans, nuts, seeds) at every meal and snack to start creating your best health at the deepest levels. Secret #2: Every 3-4 hours. As they say, timing is everything. No matter how hectic or harried your life may be (my problem), or if you’re trying to skip a meal or snack in the name of “dieting”, eating regularly pays off in higher energy and better performance throughout the day. You should eat every 3-4 hours, 3 meals and 2 snacks. I promise, promise you-if you are currently a breakfast skipper, you’re paying for it somewhere later in the day by eating too much (and often being so hungry you’re eating the wrong types of food). Jumpstart your metabolism and your energy levels with a breakfast within 1 hour of waking-and pack high energy snacks like fruit and nuts, Greek yogurt, or a mini whole wheat pita with turkey and chopped avocado. And just as with meals, when it comes to snacks, it’s real food-not junky snack food-that will most powerfully nourish you between meals. Secret #3: Eat until you feel satisfied, not stuffed. There’s a big difference between eating until you are full, versus eating until you are no longer hungry. Americans like full- but a better strategy for optimal energy is simply eating to feel satisfied. The Japanese call it “Hara Hachi Bu” - eat until you are 8 parts full. This does two things: first, it gives your brain time to catch up with your stomach. Second, it ensures you don’t overeat to the point where you feel sluggish and lose your energy while digesting that mega meal. How do you do this? Stop multitasking and eat slowly so your body’s natural signals can kick in telling you to stop eating, enjoy meals on smaller plates, and order half portions at restaurants when possible. And most importantly, the signal "I'm finished, the meal is over" should come from YOU, internally, not external cues like the food finally being gone, or when your dinner mates clear their plates. Secret #4: Sleep and Rest: Aim for 7-8 hours a night. Food is only part of the picture, of course. Rest is another cornerstone to thriving at your optimal HEALTH. And I’m talking about high quality rest-sleep-not zoning out in front of the TV or YouTube. Sleep is also a key to staying slim. It’s a critical time of rest, repair and renewal for your body-skimping on it is a surefire way to undermine your energy for the entire day. Lack of sleep has also been linked to higher risk of type 2 diabetes. And most importantly, I find that many people engage in late night couch eating- a double whammy for both energy levels and health. Set up a nighttime ritual that ensures you carve out space for rest-it will powerfully reward you with benefits ten times over, and is a cornerstone of health and healing. Secret #5: Joy and Renewal. In what turned out to be the perfect year end gift to myself, I just finished a revolutionary book: The Power of Full Engagement by Jim Loehr and Tony Schwartz of the Human Performance Institute. In it they share their powerful concept living a life of Full Engagement - which requires us take time to renew at regular intervals during each day and week. It’s a radical shift from the way most of us schedule in time for ourselves - in annual vacations, holiday weekends (which usually aren’t very restful), or a weekend trip to the gym. By fully engaging for periods of time, and then fully disengaging for even brief recovery periods during the day, (doing something that brings us joy, renewal or physical activity) we tap into significantly greater quantity and quality of energy available to us - with a powerful ripple effect across all aspects of our lives. Indeed this practice of cultivating joy and renewal daily is one of the keys to finding that elusive “balance” many of us crave but feel absent in our overscheduled, overconnected lives, and a true sign of HEALTH at a deep level. What are your New Year’s Resolutions? I’d love to hear about them! Looking to make your Thanksgiving lean AND green this year? Check out my 5 things NOT to serve so you can have a lean and green Thanksgiving. Instead of: That gooey cheese appetizer with crackers. Smarter Swap: Endive boats. Endive is a great way to incorporate some in-season produce into your holiday meal, without sparing the calorie costs. Try mixing up some low-fat cream cheese, green onion, chopped red bell-pepper, chopped pimento-stuffed olives, Tabasco sauce, and topping off some Endive leaves with the mixture for a tasty pre-turkey snack that your guests are sure to enjoy. Instead of: Whipped cream. Skip the cream to skim on calories and eco-impact. Smarter Swap: Scattering of chopped nuts with savory/sweet contrasts all the craze, a smattering of toasted pistachios or walnuts is the way to go. Smarter Swap: Try mushroom or dried fruit stuffing in place of the traditional sausage stuffing to decrease your food "footprint." Since meat and dairy make up roughly 50% of a family's "foodprint," and typical sausage contains a whopping 37 grams of fat, switching to vegetarian stuffing is great option to lean AND green your Thanksgiving plate. Instead of: A turkey from your local supermarket. Smarter Swap: A meat-free Thanksgiving ultimately has the lowest environmental impact, but if turkey is the tradition, try swapping that bird that's travelled across the country for a locally bred turkey. Local farms raise small flocks of organic turkeys that are truly free-range. Check out the Local Harvest site to find local breeders in your area. Smarter Swap: Every year, Americans throw out enough paper and plastic cups, forks, and spoons to circle the equator 300 times. Sacrifice ease of clean up for easy on the environment by using regular silverware, cups, and plates for mealtime. It's more eco-friendly, and it also turns an ordinary meal into a special occasion. Got any other swap ideas to make your Thanksgiving more lean and green? I'd love to hear them!